Heartburn can be felt as a burning sensation in your chest, usually just behind the breastbone and can extend to lower throat. Heartburn is caused by both hormonal and physical changes in the body, which is why pregnant woman often suffer from it. Most of the pregnant women experience heartburn during the second and third trimester. You will get relief from the problem after giving birth. The hormone progesterone, a muscle relaxant, is made in abundance when you are pregnant. It relaxes all the muscles in your body including the uterus, preparing the body for childbirth. However, due to this, the food and acid contents find it easier to escape back up into the esophagus, a condition which is called acid reflux, a symptom of which is heartburn. As your baby grows it needs some more space to survive, therefore uterus forces stomach upwards and puts pressure on your digestive tract, which would aggravate acid reflux into GERD (gastroesophageal reflux disease). While GERD and acid reflux are fairly common during pregnancy, it certainly doesn't make the process any easier, and actually adds to the discomfort that moms-to-be experience. 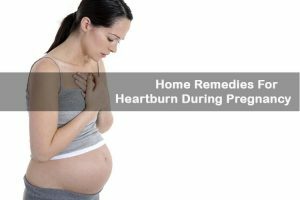 Below are some natural homemade remedies for heartburn in pregnant women. If these remedies are not effective, you may need to seek the advice of a medical professional. Almonds have a high oil content which soothes and neutralizes the acid levels in your stomach. Make sure you eat a handful of these regularly. Aloe Vera has anti-inflammatory properties which relieve heartburn. However pregnant women should not take it directly. Consult your doctor before taking it as a juice or mixed with water. Coconut water will soothe the heartburn and acts as a natural acid neutralizer. Drink coconut water regularly. Fennel seeds are a therapeutic herbal solution to help get relief. However, do not consume too much. Take 2-3 teaspoons of crushed fennel seeds in a cup of water and boil it for about 10 minutes. Strain and drink. ACV helps the digestive process by stimulating both the stomach acids and bicarbonate secreted by the pancreas. It allows the neutralizing of the acid forming foods and then soothes the stomach lining. Take one tbsp of ACV and mix with 8 oz. of water and drink. Papaya contains an enzyme for better digestion and helps to soothe the stomach by promoting a healthy acidic environment. Eat a very ripe papaya or take ripe papaya extract tablets or chewing gum. Ask your practitioner before going to use. Ginger is a natural antacid for heartburn. Take ginger either in raw, cooked or liquid form like tea. Milk and honey has a soothing property and helps in better digestion. Take a glass of warm milk and add 1 tbsp of honey. Stir it well and drink. This helps to cure acid indigestion by absorbing excess acids and reducing inflammation of the lining of the gastrointestinal tract. Steep 2 tbsp of powdered slippery elm in 2 cups of boiling water. Leave for about 5 minutes. Add honey to your taste. Alternatively, try Slippery Elm Lozenges. This is a medicinal herb removed from licorice. It contains an anti-inflammatory property to reduce the heartburn. Take in either tablets or chewing gum form regularly. Below is a list of other food items which help to reduce the heartburn. Following are the few food items which cause heartburn. Follow these tips to prevent the heartburn. Avoid spicy, oily and acidic foods. Sleep by putting your head and shoulder higher than your feet, which helps in better digestion. Avoid eating lots of food at once. Try to eat less food more often, it helps for better digestion and prevent the acid production in the stomach. Wait for at least 2 hours after taking your meals to lie down. If you really need to, sleep on your left side which helps to acids pass quickly down in your stomach. Avoid wearing skin tight clothes to avoid pressure on your belly and abdomen. Drink at least 8 to 10 glasses of water to stay hydrated but not during meal times, as this puts pressure on lower esophageal sphincter. Chew chewing gum after your meals to increases the saliva flow. It also contains bicarbonate which helps to neutralize the acids in the stomach. Eat plain and low-fat yogurt after meals or whenever you feel uncomfortable as it neutralizes the acid in the esophagus and reduces the burning feeling. Drink ginger tea or fennel tea to get relief. Antacids give instant relief from heartburn, but make sure to consult your Doctor. If it a serious problem, try for H2 blockers or proton pump inhibitors by consulting your doctor. Avoid smoking cigarettes, drinking alcohol or passive smoking. Lessen the amount of baking soda in your diet. Avoid Salicylate or acetylsalicylic acid, Aspirin in your medication. Try to bend at the knees instead of at waist. Avoid stress and stay relaxed which will help you and your baby’s health. Check your weight regularly. Follow BMI or healthcare provider advice to get the perfect weight details. Do you know any other home remedies to treat heartburn? Don’t forget to share with us. Enjoy your pregnancy! You can try coconut water or almonds to get relief from heartburn. If these remedies are not working, then consult your doctor.